Home Unlabelled HOW THE BODY OF THE MAN That PACK HIS CAR JUST TO JUMP IN TO THIRD MAINLAND RIVER WAS RECOVERED. HOW THE BODY OF THE MAN That PACK HIS CAR JUST TO JUMP IN TO THIRD MAINLAND RIVER WAS RECOVERED. 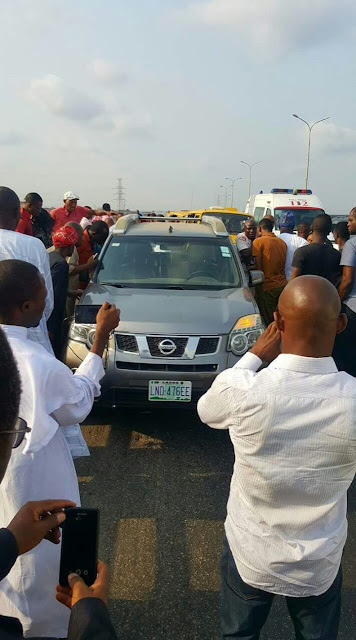 The body of the medical doctor, Allwell Orji, who jumped off the 3rd mainland bridge on Sunday evening, has been recovered. The Lagos State Commissioner of Police, Mr Fatai Owoseni, confirmed the recovery of the body on Tuesday. He said the body was recovered by the Marine Police at the Onikan end of the lagoon. The body was found three days after the incident occurred. Until his death, Dr. Orji worked at the Mount Sinai Hospital in Surulere area of Lagos State, southwest Nigeria. Spokesman of the Lagos State Emergency Management Agency (LASEMA), Mr. Kehinde Adebayo, had said the agency was alerted by concerned Nigerians. Just three days after Dr. Orji case, a similar incident has been recorded as a middle-aged woman reportedly jumped into the lagoon in the Maza-Maza area of the state. The woman was, however, rescued following the timely intervention of local fishermen and divers in the area. According to witnesses, the woman had walked casually to the Maza-Maza bridge in the Mile Two area and to the shock of people around, she took a dive into the lagoon but the fishermen dived in after her and rescued her. The woman, dressed in a blouse and trousers was earlier seen walking aimlessly and when she got to the middle of the bridge, she climbed the rail and jumped.